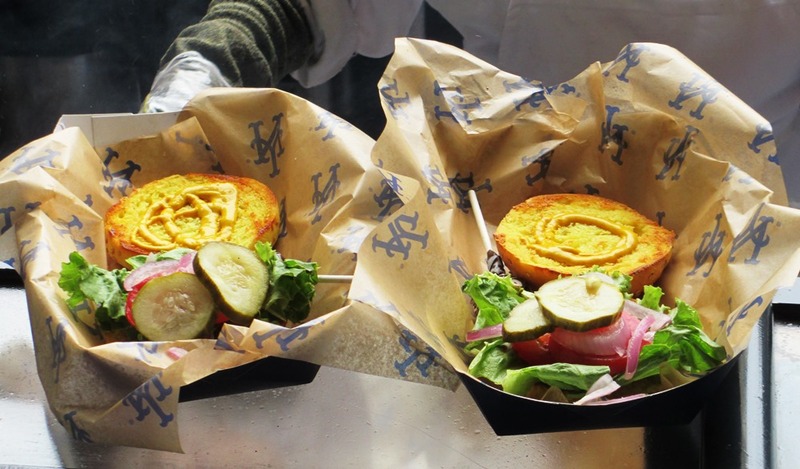 If you have trouble deciding what to eat at Citi Field, you’re not alone. The food choices at the home of the Mets are very impressive and get more so every year, with contributions from several well-known restaurateurs and award-winning executive chefs. When you include the clubs and McFadden’s restaurant, there are (at least) three kinds of gourmet pizza, half a dozen styles of burgers, and an astounding ten kinds of fries. Just on one food item alone, you could be grappling with a difficult decision. I’m here to try and help…it’s what I do…so here is a bit about four types of burgers you can get in the concourse areas at Citi Field. All very good but very different. It’s the wax paper. Trust me. 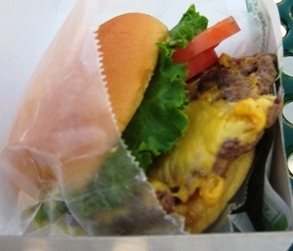 What To Eat At Citi Field, Burger #1: The Shackburger. The Shake Shack is by far the most popular food stand at Citi Field; lines get very long shortly after the gates open and stay long throughout the game. I even read that people waited for two hours in line during the 2015 World Series! The Shackburger is a fresh, juicy patty (or two) topped with yellow American cheese, lettuce, tomato and Shack Sauce, all on a potato roll. Nothing unusual, but that patty is fresh and juicy enough to serve the burger in wax paper, and the Shack Sauce is probably the selling point…a mixture of mayo, ketchup, mustard, pickles and spices. Come to think of it, there’s a condiment for everyone in the Shack Sauce, which may explain its popularity. Worth missing at least an inning waiting in line? That depends on your degree of loving baseball vs. food. It’s a great burger, but get a double and get some of the excellent fries or a concrete if you’re going wait that long. There you go. The Champion. 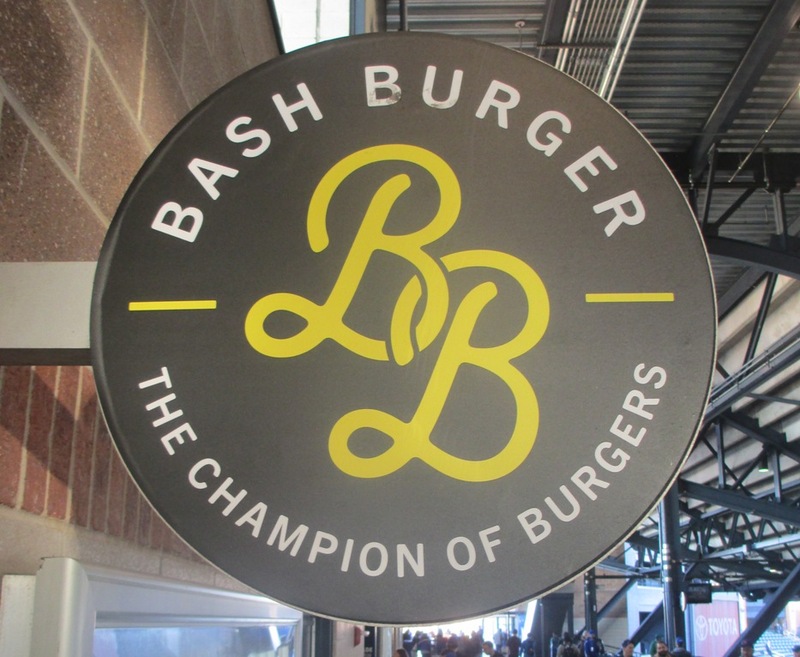 What To Eat at Citi Field, Burger #2: The Bash Burger. Have you ever heard of “bacon jam”? Until Chef Josh Capon introduced the Bash Burger to Citi Field, I hadn’t…but it definitely sounds like something I’d like on my burger. The Bash Burger, unfortunately, replaced Capon’s amazing “Pressed” grilled cheese sandwiches, but Capon has a lot of credit with me, so I’m sure the offering here…a Pat LaFrieda patty with onion and bacon jam, pickles, American cheese and special sauce…is up to a standard where burgers should be. You can get a double, of course, and I know that sounds like a Big Mac, but I’m pretty certain the quality of burger is better. Not that Big Macs aren’t awesome of course. Featuring the Tootsie Pop bonus! What To Eat At Citi Field, Burger #3: The Keith’s Grill Burger. There are a few good reasons to refuse to conform with the Shake Shack crowd and instead stand in the smaller lines for Bash or Keith’s burgers. The first is that you don’t wait in line nearly as long, of course. But you also get to patronize the stand of a Mets great, and last but not least, you get a Tootsie Pop with your burger. That kind of evens the score right there, doesn’t it? Keith’s Grill has just two types of burgers: the Mex Burger with Jack cheese, guacamole, chipotle mayo and jalapenos, or the new (as of 2016) “108 Burger”…with pastrami (! ), Havarti cheese and deli mustard on a pretzel bun. It’s an easy decision, and you get an unusual burger either way. LaFrieda = good beef, like Nathan’s = good dogs. What To Eat At Citi Field, Burger #4: The Generic Burger. Yes, that’s right, there is no shame in trying the burger at the aptly named “Burgers and Fries” stands at Citi Field. These burgers on the surface seem to be no frills…but in fact the beef is provided by the inimitable Pat LaFrieda, who has been providing the meat for several top NYC institutions, like the Union Square Café, the Spotted Pig, and oh yes, the Shake Shack. Besides that, the condiment stands at Citi Field are the best I’ve seen in a ballpark…you can pile sauerkraut, jalapenos, or even that red onion relish that itself is worth a trip to NYC on your burger. Nothing wrong with anything that the Shake Shack or Keith’s puts on a burger, but here you can customize it yourself. The generic burger isn’t any cheaper, but it’s every bit as high quality stuff, and at the generic stands you can get some Nathan’s fries to go with it…which are no slouches in the French fry department, as every New Yorker knows. 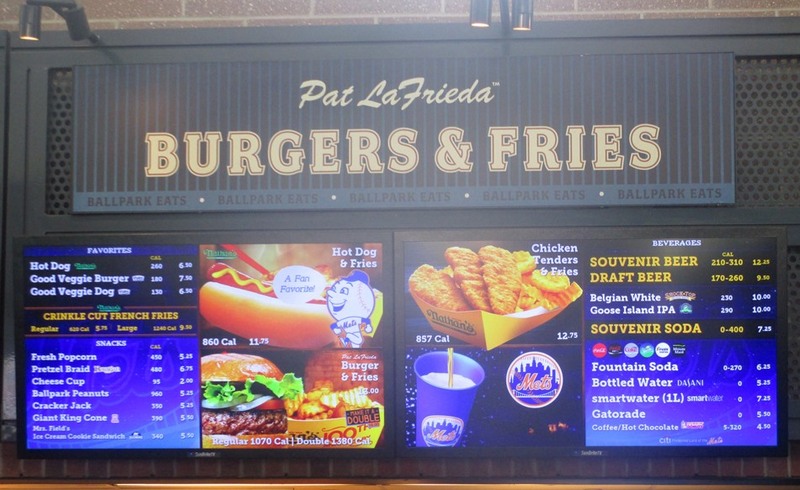 I hope this helps if you’re faced with the difficult choice of what to eat at Citi Field, at least if you’re in the mood for a decent burger. When you want fries with that, check this page.